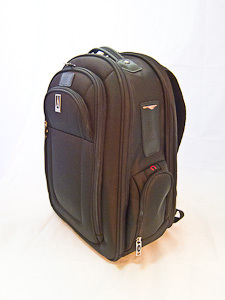 I recently had the opportunity to try out Travelpro’s Crew 8 Business Backpack and 22” Expandable Rollaboard Suiter. In a word – brilliant. It’s no wonder why so many flight crews swear by this luggage and use it every day. The attention to detail is refreshing in a world where there are so many cookie cutter products competing for your dollar. With this line, if you are like me, you ‘ll be amazed at all the ‘ah-ha” moments as you start to actually pack your things. Before using this 22” Rollaboard suiter, I would usually have to take a separate triple fold garment bag for my suit or sport coats, in addition to my 22” rollaboard bag. If I also had my computer backpack, that meant I had to check at least one bag. Such a hassle; and now, such an expense. With this combination suiter and rollaboard, that’s a thing of the past. The top flap of the rollaboard case has a built-in, ingenious suiter sleeve that works quite elegantly and yet can be removed if not needed. I used my Shelves to GO! unit in this case and it worked like a dream. I was packed and unpacked in nothing flat. I also love the dual post, i-beam extension handle used to pull the bag. It offers two different stops to adjust to either 38” or 43” lengths (really smart) and they say they have tested it to over 15,000 cycles. That’s really the last part of a bag that you want to break, and so often with cheap brands, that’s exactly what goes first. The other part that usually fails is the wheel. Rollaboards aren’t so convenient when only one wheel is left. (Sometime I’ll tell you about trying to pull a one-wheeled roller duffle bag a half mile through San Francisco.) With Travelpro, again they give you super high quality to start with, and then engineer the product to make it easy to replace when eventually you’ve just walked too far. One simple screwdriver and you can replace the wheels yourself. The Business Backpack is equally a work of thoughtful design. With a quick loop, it will slide over the Rollaboard handle and sit snugly in place as you pull it to the gate. Opening the rear most zipper also reveals a swing-out computer sleeve that is TSA approved, so you don’t need to actually remove your laptop before going through the scanner. The computer section will not hold a 17” or 18” laptop, but everything smaller fits quite well. The backpack offers plenty of pockets and sleeves for just about any device you want to bring along. An iPod port enables you to route your earphone wires outside the pack while keeping your MP3 player tucked safely inside. An expandable mesh pocket on the front of the carrying strap enables you to keep your phone easily accessible. When opening any zippered compartment, it’s nice to notice that all the fold out flaps have fabric hinges to prevent your belongings from falling to the floor should you release your grip. A pullout mesh pocket is also handy for that bottle of water you bought to bring on board. In the main compartment, there is a folder divider to separate your magazines, file folders, etc. The nice part about this one is that it folds completely flat against the front wall of that section if you don’t need it. Without it being open, I was able to add a very large camera bag right into this section. Another great feature is that every section of the bags have heavy duty metal pulls with a very large circle opening so they can be locked together. Using my GrabGuard, I was able to secure the backpack and the rollaboard to the metal seats in a couple different airports. If you are going to travel frequently and you haven’t researched the Travelpro line, you’ll be amazed at what you’ve been missing. Check them out on-line at http://travelpro.com for a list of on-line as well as brick and mortar retailers. Product Review – Shelves to GO!